February 9, 2017 By This post may contain affiliate links. Need a quick and easy last minute gift for Valentine’s Day? 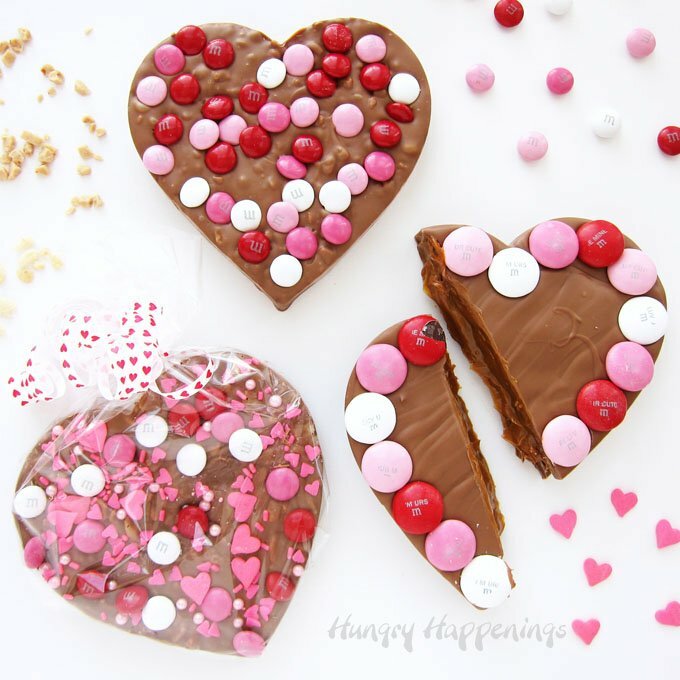 Make some pretty Chocolate Bark Hearts for your loved ones. You can fill your hearts with toffee bits, crispy rice cereal, or caramel then decorate them with colorful red, pink, and white M&M’s candies. Valentine’s Day is just days away. Do you have a gift for your sweetheart? Every year I make some chocolate to give to my husband. He wouldn’t expect anything less. He loves my chocolate bark so I often shape it into a heart for Valentine’s Day. 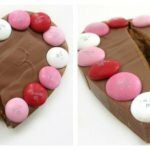 This year, I decided to dress the chocolate bark hearts up a bit by sprinkling on some M&M’s candies. I couldn’t decide which flavor to make for him, so I made three of his favorite barks. The first is filled with toffee bits and is topped with Valentine’s Day M&M’s. The Crispy Crunch Bark Heart is loaded with crispy rice cereal and covered in a mix of Valentine’s Day sprinkles and M&M’s. The most decadent heart has ooey gooey Dulce de Leche (caramelized sweetened condensed milk) inside and is decorated with Cupid’s Message M&M’s. The Mega M&M candies line the edge of the 5 inch heart perfectly. These heart are easy to make using a heart shaped cookie cutter. You can use pure milk chocolate which needs to be melted and tempered or simply use melted confectionery coating (Candy Melts, Melting Chocolate, or Almond Bark). See my Chocolate Making Tips page for detailed instructions on choosing the right chocolate and properly melting it to make these chocolate bark hearts. Check out this video to see just how easy you can make your own chocolate bark hearts at home. 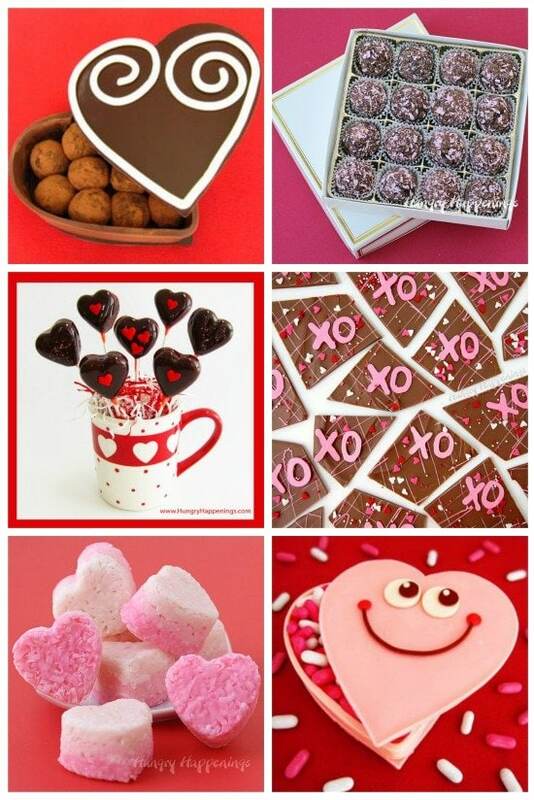 You can find the items needed to make these chocolate hearts on Amazon (commission earned for sales). Milk chocolate hearts filled with either toffee, crispy rice cereal, or caramel are decorated with M&M's for Valentine's Day. Stir the toffee bits into the chocolate and pour into a 5 inch heart cookie cutter. Chill in the refrigerator if using pure chocolate and in the freezer if using Candy Melts until the chocolate hardens, about 10 minutes. Remove and pop the chocolate out of the cookie cutter. Set aside at room temperature for 20-30 minutes before packaging in clear cellophane bags. 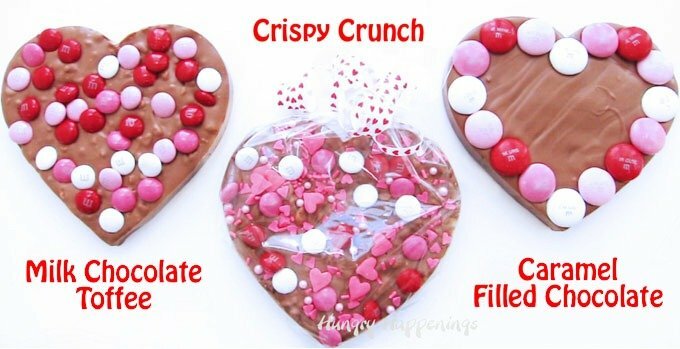 Stir the crisp rice cereal into the chocolate and pour into a 5 inch heart cookie cutter. Sprinkle on M&M's and sprinkle mixture. Spoon Dulce de Leche into a disposable pastry bag. Pour half of the chocolate into the heart shaped cookie cutter and spread it into an even layer. Pipe a heart of the Dulce de Leche into the center of the chocolate. Chill for 3-5 minutes until the chocolate begins to set. Pour the remaining chocolate over top and spread into an even layer. Arrange the Mega M&M's around the perimeter of the heart. Set aside for 20-30 minutes before packaging. You can use any size heart shaped cookie cutter to make your hearts. I used 5 inch cutters and 1/2 cup (4 ounces) of chocolate. You’ll need to adjust the amount of chocolate and filling depending on the size cutter you use. Package your hearts in 4x2x9 inch clear cellophane bags.